The magic word here is ‘could’ as three prominent (and very rich) investors team up for the ultimate nerd dream: building a giant plane. Hold on, because by ‘giant plane’ is meant an aircraft so huge, it will take a 12,000 foot runway to take off. 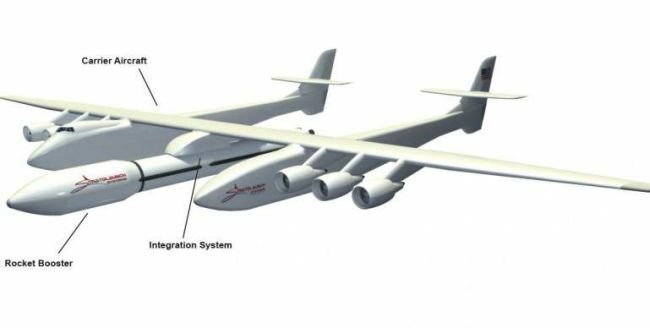 That’s the Stratolaunch, a beast of a delivery vehicle for taking passengers and cargo off world in an earnest bid to jumpstart America’s dwindling space program. If this all reeks of Howard Hughes, that’s cool. Unfortunately, Howard Hughes is more myth than man—the famed hypochondriac bedeviled by gross eccentricities is often given too much credit for his ‘innovations.’ What about all those talented unsung engineers at Hughes Aircraft? Among Hughes’ most enduring stunts is the storied Spruce Goose, another much publicized ‘biggest plane ever’ that took off for a few minutes then landed on a waterfront. Anyway, it would be interesting to see how far the Stratolaunch goes. The combined powers of Paul Allen, Burt Rutan, Ellon Musk are behind the start up Stratolaunch Sytem and so far only a short promo vid is available for mass consumption. Wonder if a really gigantic plane must be easier to build if a joint Russo-American effort set their sights on such a goal? Imagine Boeing-Ilyushin-Antonov teaming up for a one off project of super epic magnitude. After all, they all build some of the world’s largest operational aircraft.